While employee uniforms are commonly used in the workplace, different industries like healthcare, hospitality, and food service use uniforms with a variety of strategies for a range of purposes. For companies and industries with a constant demand for their services, uniforms and uniform color strategies geared towards functionality help to improve the efficiency and productivity of employees. Simultaneously, uniform color schemes are also used to build on subliminal psychological effects of color on customers to boost the effectiveness of brand messaging and improve customer experience. So, how does one determine the uniforms to best serve their company goals and needs? Here, we take a closer look at the comparison between uniforms designed for function and uniforms chosen to connect with potential customers—outlining the effectiveness and overall role uniform color plays in uniforms, and how companies can plan their uniform service to best suit business needs. What’s More Important for Company Uniforms—Functionality or Psychology? When it comes to employee uniforms, their color can often leave a subtle, yet significant impact on the state of mind of not only employees, but customers as well. However, because uniform colors can additionally serve more practical uses as well, companies must first determine how best to balance their uniform service between purpose and appearance when deciding on uniform colors. To simplify the challenge of finding a compromise between uniform color psychology and functionality, the problem can be narrowed down to a question of the business’s main purpose or goals. For industries which provide vital services to the public that all people require, there is little need for uniforms to market to customers since there will always be a demand for their services. As a result, uniform color strategies geared to help improve employee efficiency and productivity are usually ideal, as this helps employees to in turn provide better service for customers. On the flip side however, when companies are competing to advertise and sell their products or services which aren’t essential to everyday life, using uniform color psychology to better connect with potential customers and attract their business is generally a more preferable approach. So Which Uniform Color Strategy Best Suits Your Business? Different businesses and industries provide different purposes—with some providing required services to live like healthcare, while others offer more luxurious or less-necessary experiences like a night out at a fancy restaurant. 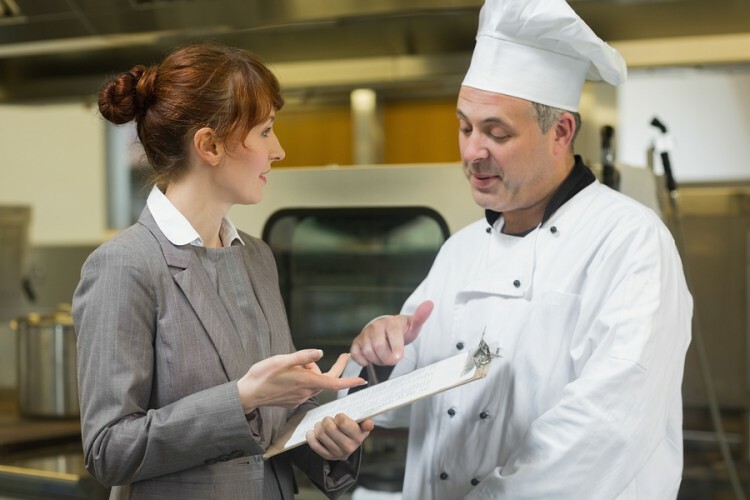 From high-end bistros and small fast-food restaurants, to luxury resorts and mid-range motels, the key to successful food service uniforms revolves around creating a comfortable and enjoyable customer experience. With this in mind, the effects of color psychology can be used for uniform color selection to reinforce these feelings. Customers often have strong subconscious responses to uniforms and their colors, as the employees wearing them embody the brand—making the business more tangible than just a name. For instance, the color black is often associated with feelings and ideas of professionalism, authority, and expertise, while gold is likewise typically associated with prestige or quality—creating a perfect mixture of the message and experience a high-end hotel or steakhouse wants to convey to customers. On the other hand, smaller restaurants and businesses also seek to create a comfortable balance of uniform color. Colors like red and yellow are often used in logos and uniforms to combine the feelings of happiness or warmth brought out by yellow with red’s tendency to incite excitement and attract attention—enticing customers and creating a friendly business environment. Since personal injuries, illnesses, and childbirth are unavoidable aspects of everyday life, hospitals have relatively little need to market themselves to potential patients. When someone has a heart attack, they aren’t taken to the hospital with their favorite color schemes or most well-dressed staff—they’re taken to their nearest healthcare facility. However, there are still plenty of ways uniform color can be used to help healthcare staff perform job functions better. For lab coats, smocks, or aprons used in operating rooms, labs, and patient visits, white is for the large part the standard. The epitome of cleanliness, white helps make clear when uniforms are dirtied with potentially infectious materials—giving staff an immediate indication for when proper disposal and cleaning is required. Furthermore, large healthcare facilities have numerous individual units like neurology, pediatrics, and labor and delivery—and to help patients and other employees visually identify staff and the type of work they’re doing, have their staff wear color-coded scrubs. With some industries tending to gravitate more towards the functional while others seek to play on color psychology for creating a comfortable customer experience, it’s important for businesses to carefully consider their individual needs when selecting uniform color and services. At Uniform Nations, we partner with a nationwide network of the top uniform service providers, helping to provide the range of uniform options various industries need to boost employee efficiency and attract potential customers. For a free estimate or to learn more about uniform services for a variety of industries, just give us a call today at (866) 467-4178, or simply fill out the form to the right of your screen to get free quotes on industry-specific uniform services from the top providers in your area. With numerous studies investigating the relationship between color psychology and human emotion or thought, savvy business owners have an opportunity to capitalize on these subconscious responses by using color to improve employee efficiency and customer experiences. Get insight on how to effectively implement color psychology with your uniform service with the help of this in-depth white paper. The color spectrum contains a wide range of colors with various hues and shades, so how does a business decide which colors will best suit their needs and goals? Get a breakdown with the color-by-color specifics on the effects of uniforms in different colors using this handy infographic guide. Considering the range of uniforms colors and their uses for different industries, it’s important companies consider their industry-specific needs and business goals when selecting color for their uniform service. Get insight on the potential applications for uniform color in the hospitality industry here.